Model 19 All bronze, equipped with handwheel for easy adjustment within spring ranges. Model 19M Same as model 19 except SS trim (seat and disc). Available 21/2" and 3" only. For higher pressure settings or severe applications. Model 200A Special non-chattering design. Recommended for light oils and continuous by-pass or pressure regulation. UL842 listed for light oil service. Available 3/4" to 11/2" sizes. Female NPT connections only. 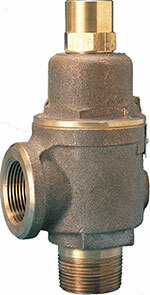 Note: * Back pressure increases set pressure on a one to one basis, and reduces capacity. Back pressure in excess of 10% of set pressure is not recommended. Both inlet and outlet connections are cast integral with body to permit easy inspection and servicing without disconnecting piping. Beveled seats lapped for optimum performance. Stainless Steel (SS) spring for optimum corrosion resistance.